Have you ever met a very strong endgame player, that is not so good overall? I haven't. Is that a coincidence? I don't think so, and there is one very good reason for that. Without a solid understanding of how pieces work together on the most fundamental level, you can't play middlegame or an opening to the FULL CAPACITY. Even after memorizing those there is no guarantee you'll retain the information and recall it when it arises in one of your games. And the worst part, what if it is slightly different from what you've learned in the book? Then you're officially stuck. I know it sounds awful. That's why I want to show you a much better way. This course has a very different perspective on improving your endgames. 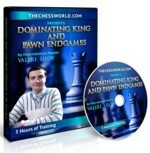 Instead of taking a usual route of memorizing hundreds of positions, you'll learn the key endgame themes, strategic plans, and ideas. That’s a far more efficient way of studying endgames because in chess the endgame and strategy are always interconnected, following one another. 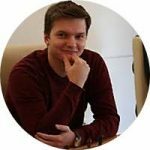 In this 10-hour "university level" course, IM Mat Kolosovski provides you with the full arsenal of all the necessary tools to crack practical endings. By learning those 5 endgame themes and applying Mat’s thinking models you'll be able to maximize your over the board performance in no time! How to convert your endgame advantage into a clear win - the most common mistakes to avoid. It is never easy but once you learn the thinking mechanism you'll find your game elevated to the next level. The practical approach of defending in inferior positions - a must know for all competitive chess players. This is what separates IMs and GMs from the rest of the field. 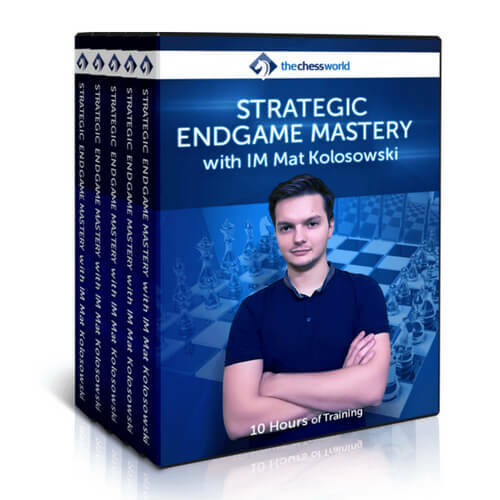 In this 20-lesson, 10-hour mastery course IM Mat Kolosovski provides you with the full arsenal of all the necessary tools to crack practical endings. By learning those 5 endgame themes and applying Mat’s thinking models you'll be able to maximize your over the board performance in no time! Train the endgame motifs and important move sequences with a set of specifically designed tasks and challenges. Practical part is an important element of the course. Set of extra training tasks, which are designed to challenge your endgame skills after completing the course. Think of it as your final exam. PGNs with solutions are included as well. 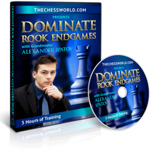 Rook endgames are the most common and probably one of the most complex of all endings. No wonder 90% of chess players have trouble with them. This course will make rook endgames one of your strongest sides! Despite its visual simplicity, king and pawn endgame is a very complicated subject in chess. The majority of club level players nowadays do not spend an appropriate amount of time to get familiar even with some of the most typical positions. This course will fix that!